Greetings and salutations, everyone; yes, once again it is I, your popular host, Mani the purebred border collie, here to bring you the latest news from our garden. You may remember me from such posts as “Under The Arbor”, among so many, many others. Here I am in a characteristic pose. As you can see, I look a lot less calm than I did in my last post. There’s a reason for that, which the movies I’m presenting tonight will demonstrate. You can see a trash bag float down the street here. The garden is in pretty bad shape, but a lot of the mess is from leaves from neighbors’ trees. The forecast calls for even worse weather later this week. That makes him pretty nervous to think about, but when the storm actually happened here he was on the phone talking about it, and then made the movies. He says sometimes things aren’t as terrible as he imagines them to be when he thinks about them happening in the future. The apple tree doesn’t look so great. It was the first thing the guy I live with planted here. There was a row of six of them, but either they died or were removed, and just this one remains. He said he’ll probably cut it down now; it’s got fire blight, and the squirrels bite into the apples and drop them on the ground. A couple of the purebred border collies who lived here would snack on apples from time to time, but that’s all. (You can also see that the camera lens got wet.) I still went on my evening walk. It was pretty different. The street flooded. 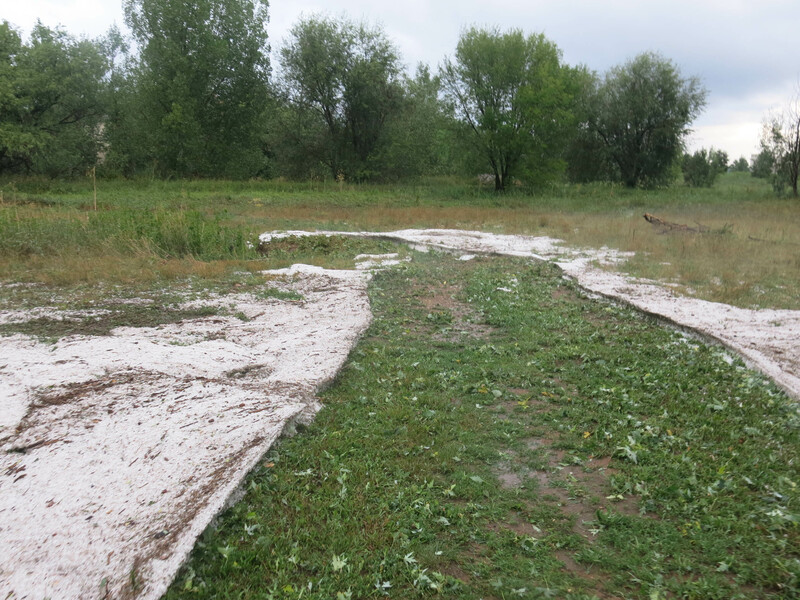 Water poured into the field, carrying a lot of stuff with it. The guy I live with said he hopes this is the last storm that comes over our little neighborhood this summer, but maybe that’s not so likely. He also said that all the bulbs were underground; a sensible place to be. Wow Mani that is crazy! I am glad you were safe inside. 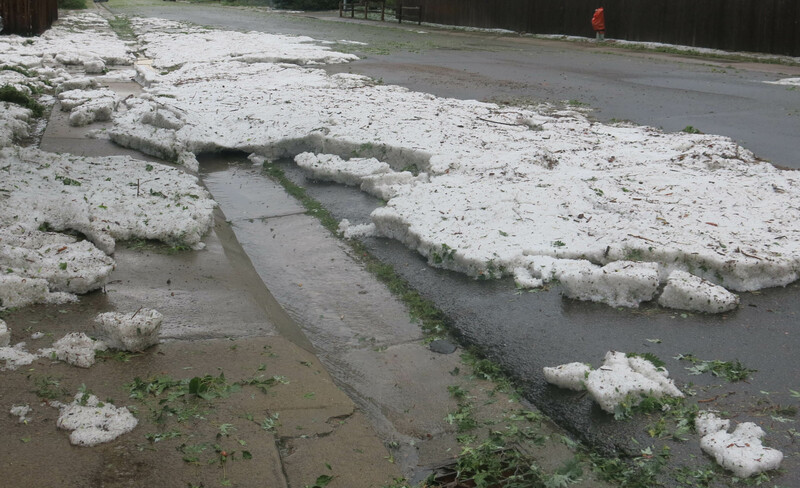 I don’t think I have ever seen that much hail before let alone in the Summer. If only we could have a little bit of that here it would help with our fires. Stay safe! It was pretty scary, for sure. But I was pretty brave, considering. Whoa! Looks like you guys had one heck of a storm. I’m glad you were safe inside as the weather swept through your area. I’m originally from MA and the storms here both amaze and stun me with their ferocity. They seem to arise out of nowhere and hammer us. Nature is fierce at times. Well, stay safe and as calm as possible. Summer and its violent storms will soon pass. The guy I live with said he’s definitely ready for summer to be over. This has been one of the worst summers he’s ever seen. Of course autumn and winter could be bad too, but probably not, because summer is the bad time here. Ha! A forecast of nothing but sun for a week? What do they know, right? I could tell right off by your characteristic pose photo there must have been a storm. You just had that look on your face. That’s a nice photo of you looking to the left. Were you looking at something in particular? We could use some of that cool wetness here, for the smoke, but not quite like that. The vegetable garden wouldn’t survive. I could almost imagine that trash bag going down the street to be a large muskrat! Hope the guy you live with will be home with you when the worse storm hits! Do you ever try herbal calming chews, or a Thundershirt? Personally, having work in a pet store, Thundershirts only work for the minority of dogs. 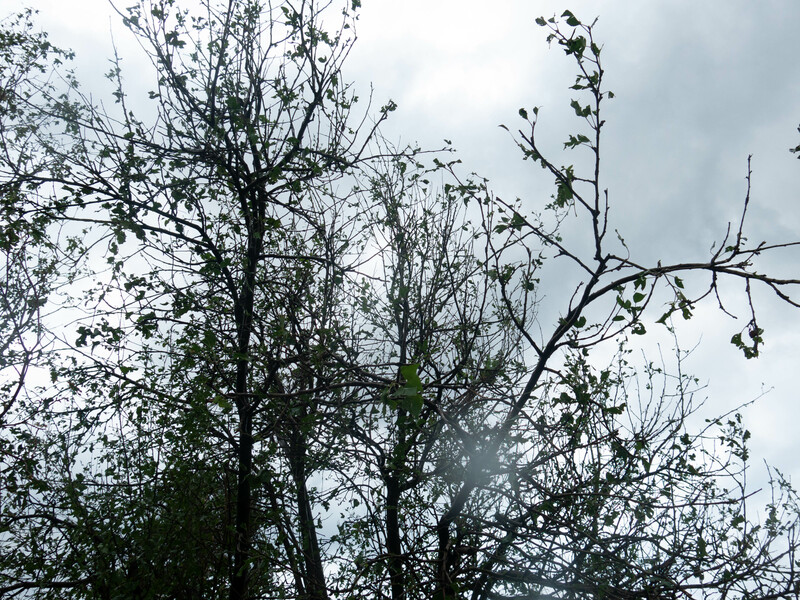 I don’t think I was looking at anything, except maybe how few leaves the honey locust had left. The guy I live with says the tree might not make it, after this. He has a serious panic issue with the idea of him being in one place and me being in another, but that doesn’t happen very often. I do have a Thundershirt. It belonged to Chess. I’ve worn it once. We didn’t really have very much thunder with this storm in any case. The neighbors who grow a lot of vegetables don’t have them any more, but the guy I live with suggested they build A-frames, like the bulb frames here, which would protect the plants. Wow Mani ! Golf ball sized hail stones ! It is lucky you and the guy you live with were together inside. Not quite as big as golf balls (slightly smaller than shooter marbles), but we had a lot of it. That storm came on quick and beasty. Huge lightning. Caught in golden. Damag hail. Poor car cant get a break. House just heavy downpour with wicked wind. AuGust! It was pretty scary. Things like this don’t usually happen in August. But this has been a bad summer for storms. What a horrific mess! You were brave indeed. Is it wrong that the trashbag trundling along made me laugh out loud? It looks as if it’s taking advantage of the storm to make its escape and have a great adventure. A lot of people thought the trash bag floating down the gutter was pretty funny. I guess there were two, which floated down until they got to the storm drain, and blocked it. Though there was flooding from the other side of the street because the storm drain right across the street is way too small for the amount of water it has to carry. Is that Perovskia just beyond the pots, looking unfazed by the h___? This kind of event would seem to be another powerful argument in favor of grasses, especially smaller ones. No, that’s Artemisia ‘Silver Frost’. The guy I live with can’t grow perovskias at all. Like the only person on the planet for whom they’re difficult. Still trying. Small grasses, like blue grama and galleta, are indeed excellent. As is just sitting out the summer, which we kind of do already anyway. How huge your eyes are, dear dog. Clearly an upsetting hail storm. I admire your inspection of the garden afterward, I can tell you were being extra thorough. I like to be on the phone with a friend, talking, when something unusual occurs, but of course you and the guy have each other. In your first portrait, you appear to have captured a small animal. What is it and where did you get it, please. I know the comfort animal in the final photo, of course. Thank the guy for making the videos. I showed them around because we don’t see events like that around here. 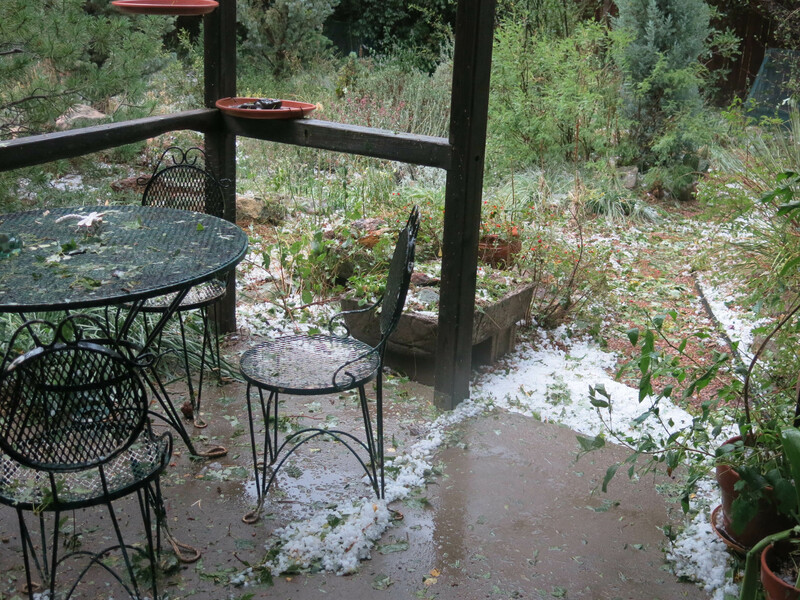 Thanks; the storm was pretty scary and the garden is mostly trashed. 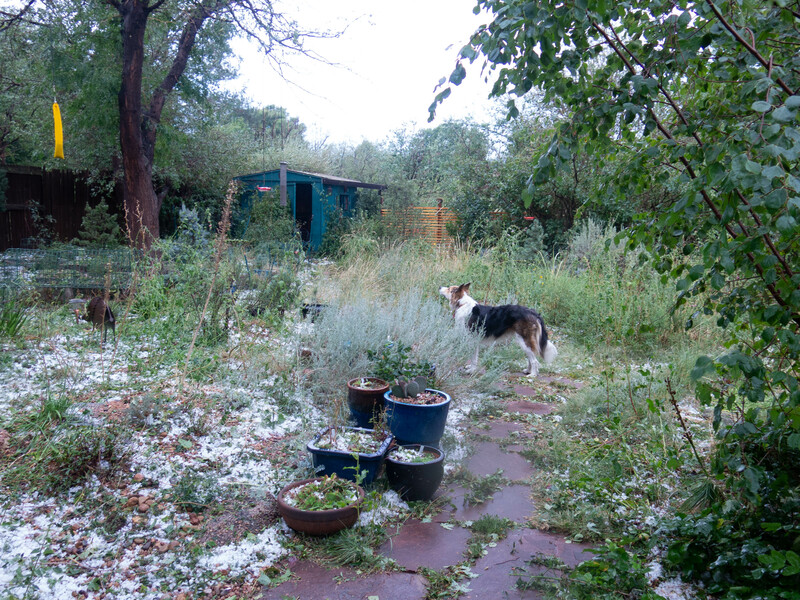 Although there’s a lot of worrying about the idea of storms, especially if the two of us are separated, somehow, the guy I live with said it would be weird to hugely care about the garden being trashed and still live here. In fact a bunch of plants will probably be removed and that will be that. Other stuff will be grown instead. Like imagine having a tomato ranch in a climate where it froze in July every third year and getting upset about that. Well, anyway. What I have in the first picture is Nedgehog, the hedgehog. I’m not sure where Nedgehog came from. There are three of them here, all with the same brilliantly clever name. I think they belonged to Chess. I guess we purebred border collies like having multiple hedgehog toys. Does Nedgehog honk instead of squeak? 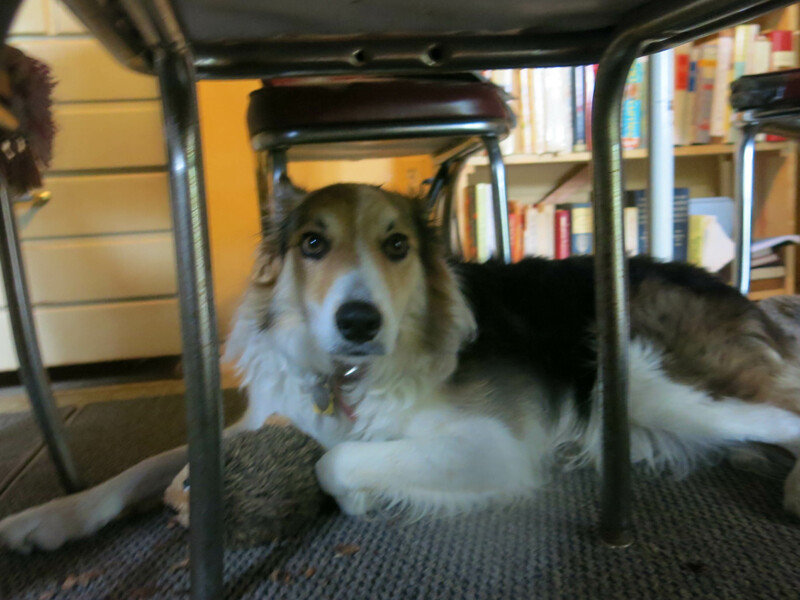 Boo, the not-purebred border collie loves his honkin’ hedgehogs. He nibbles ears and tags and noses off, then keeps the body to honk. I get the ones in costumes so he has more to nibble! I found a huge one (about 2′ long) one Christmas, with a lumberjack fabric body. It freaked Boo out! It seems you keep your toys in good condition for far too long! Chew them up and you’ll get new ones! The guy I live with says I’m spoiled (can’t you believe that?) and have more toys than almost anyone. I really like the squeakless ones, and every so often a get a new one, or two, even though I supposedly already have plenty of toys. I can’t quite figure this out. 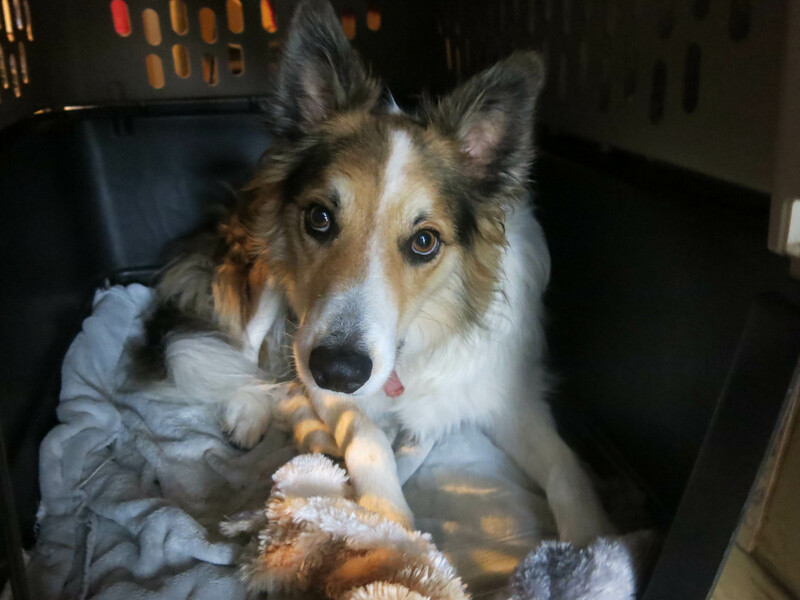 Rhody says that border collies are scaredy cats. Yes, we pretty much are. The guy I live with says we purebred border collies are fraidy-dogs. Yet we can be tough, threatening, fierce, and deadly in certain situations. Like when someone delivers something to the front door. I really do not believe that Rhody expected you to agree with him. Do you know why all dogs of all breeds hate mail carriers? Is it just a tradition that no one questions, or are there reasons for it? Well, I know that both Slipper and Chess were totally fierce and vicious when anyone came to the front door. Chess was the terror of the mail carrier, UPS and FedEx delivery people. Slipper would stick his whole head through the screen door and be all deadly and stuff. I can definitely be fierce, deadly, and vicious when I’m on my walk and I see another dog. We’re protectors. Naturally. What are you protecting? What are you protecting it from? Rhody wants to meet everyone and go home with them, except of course mail carriers. He is very social. Certain things need protecting. They just do. You should see me trying to get at the people coming to the door, trying to sell us a new roof. A new roof might help defend from the scary hail. Please share with tgylw that I just read his memory evoked by the mention of Necco wafers (I’m the one who loves to eat them at the movies, still in the present day…). What an astonishing memory and so vivid in detail that I could smell the books and see the bricks in the grass in the yard on that tree-lined street. Please thank him for sharing that deep memory; I feel honored by it. He should write screen plays: all the detail of sights and sound and depth of living are there. Amazing. If he could eat Necco wafers now, I would enjoy sending him some, while they are still available! And for you, Mani, a bag of Bocce brand heart shaped dear-doggie treats! Thanks. Just yesterday the guy I live with went to the Asian Market, and while he was standing in line there was someone carrying a food item he’d never heard of. When he came home he looked it up and discovered it was used in Filipino cuisine. He didn’t think anything more about it. Then all of a sudden he realized that the word “Filipino”, like “Philippines” and “Manila””, actually had a huge significance for him when he was a kid. His grandparents, and his mom of course, were stationed on Corregidor just before the war. So there was talk about the Philippines all the time. The rattan couch you see me lying on here was probably purchased in Manila about 1937. There are lots of things in the house that were probably acquired in the Philippines. That’s how his memory works.